Henndorf am Wallersee is a village with a population of a bit under 5,000. Henndorf is situated some 20 kilometres north of Salzburg and a typical example for a commuter town, of which you find many in the vicinity of Salzburg, especially in the Flachgau area. Like most of these villages, Henndorf grew tremendously after WWII. Before then, it was a sleepy village (some will say that it still is) by Lake Wallersee, the biggest lake in the Salzburg Lake District (Salzburger Seenland). The word Henndorf means "Chicken Village", but is actually derived from an old German term for "high village", referring to the higher altitude of the original settlement on a hill. International visitors are rarely seen in Henndorf, as it lacks any major sightseeing attractions. If foreigners take notice of Henndorf, it is usually for the literature that was produced here. The local painter Carl Mayr was a key-figure in formalising the modern Dirndl dress in the 1920ies. The Henndorfer Tracht (Henndorf Traditional Costume) was among the first formal costumes of this kind to be introduced at the Salzburg Festival and was of paramount importance in introducing linen into Austrian fashion as well as making Salzburg one of the centres of Tracht manufacturing. In the late 1920ies, Henndorf was a fashionable place to spend a summer. This was largely due to the Salzburg Festival, which drove many wealthy art fans to the city. Some of them preferred to spend their time on the countryside, ideally by a lake - and Henndorf provided just the perfect conditions for that. One of the first artists who discovered Henndorf was the German playwright Carl Zuckmayer. He bought a mill there and attracted an eminent circle of friends to the village by Lake Wallersee. Ödön von Horvath, an Austro-Hungarian writer, spend a lot of time there. Others were just visitors; Zuckmayer stayed in Henndorf permanently for several years after the Nazis seized power in Germany in 1933. Ironically, the Flachgau was a hotbed of Austrian Nazis and the seemingly appreciated Zuckmayer (who was Jewish) had to flee again in 1938. Rumour has it that parts of his furniture could still be found in some Henndorf households. It was looted by Nazi functionaries. Another important literature figure is Thomas Bernhard, who spent a lot of time with his grandfather Johannes Freumbichler (a writer himself) in Henndorf during his childhood. Other writers with a Henndorf connection are only local celebrities, such as the dialect writers Sylvester Wagner or Franz Stelzhammer. Both of them are buried in Henndorf. 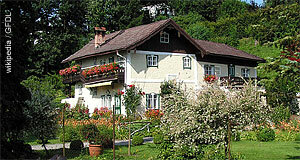 International visitors might find accommodation in Henndorf that is cheaper than in Salzburg. If you have your own car, it is very feasible to drive to the city within 20 minutes. There is no railway in Henndorf, though. Sightseeing will be limited to the village centre and a few hiking paths. Note for example the Eiszeitweg (Ice Age Path) of Henndorf, which will point you at typical features of the Flachgau landscape, which was shaped during the last Ice Age.